Today’s cookies are thanks to Bernadette Burns, a patron of the Kingston Branch. “An old fashion crispy, chewy treat. 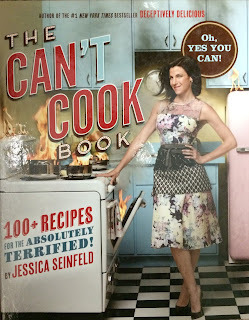 My man Jerry Seinfeld is all over these.” This recipe can be found in The Can’t Cook Book: 100 + Recipes for the Absolutely Terrified! by Jessica Seinfeld. At least one hour beforehand, take the butter out of the refrigerator and let it come to room temperature. Heat the oven (with two oven racks toward the middle) to 350 degrees F. Line 2 rimmed sheet pans with parchment paper. In a medium bowl, measure and whisk together the flour, cinnamon, baking soda, and salt. In a large mixing bowl, combine the butter and sugar and beat with an electric mixer on medium-high speed (or by hand with a wooden spoon) until fluffy, 2 to 3 minutes, scraping down the sides with a silicone spatula as necessary. Stop the mixer; add the egg and the maple syrup then beat in. Scrape down the sides. With the mixer on low speed, use a large spoon to gradually add the flour mixture and mix until just incorporated. Stir in the oats and raisins. Once cool, store in an airtight container for up to 4 days. Today’s delights were made by Dorothy McDonald of the Annapolis Royal Branch. 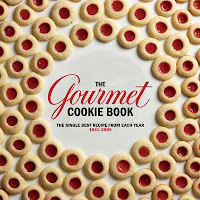 The recipe I selected this year is from "The Gourmet Cookie Book: the single best recipes from each year, 1941-2009"
Never, ever having considered myself a gourmet cook, I chose the book anyway, curious to see what cookies made the cut. 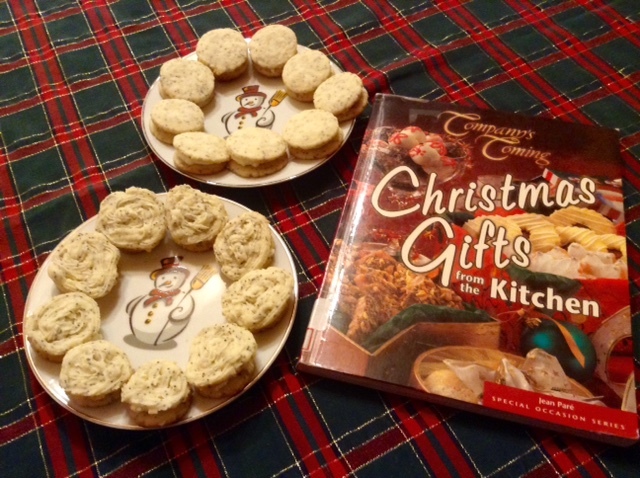 This recipe was created in response to a reader's appeal for "cookies made with coconut and sprinkled with powdered sugar that have cake-like bottoms and chewy tops." Imagine...it was so long ago she couldn't just Google it!! The recipe list from the issue where this cookie is found also includes Young Partridge with Grapes, Poached Marrow, Couscous and Goose liver Pies, so this 'no fuss' cookie must be good to have been included with such gourmet-sounding fare! Merry Christmas and Happy New Year, everybody!! Cream 1/2 cup softened butter. Add gradually 1/2 cup brown sugar and beat until smooth. Stir in 1 cup sifted flour and spread in the bottom of an 8-in square pan. Bake in a moderate oven for 20 minutes. Beat 2 eggs and 1 cup light brown sugar until smooth. Stir in 1 tsp. vanilla, 1 cup chopped walnuts and 1/2 cup shredded coconut tossed with 2 Tbsp. flour and a pinch of salt. Spread this batter over the baked crust and continue to bake 20 min. longer. Cool, sprinkle with powdered sugar and cut into squares or bars. The recipe suggested buttering the pan and lining it with 2 criss-crossed sheets of aluminum foil which are then buttered as well, but I didn't do this, just buttered the pan. I will use either the foil or parchment paper the next time as it would make them easier to cut. Don't forget-- you too can Enter to win a gift card. Show us YOUR cookies! We have received two entries so far from our baking friends. Get in on the action and show us your cookies! You could win a gift card! 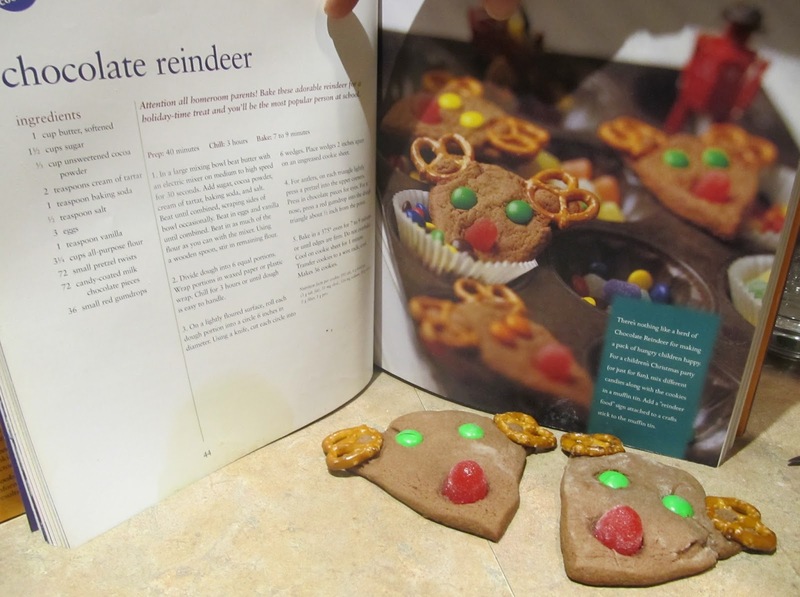 Daniel Duke made these Gingerbread Cookies from Company'sComing: Cooking at Home. Daniel shared his cookies with his mailman and bus drivers. 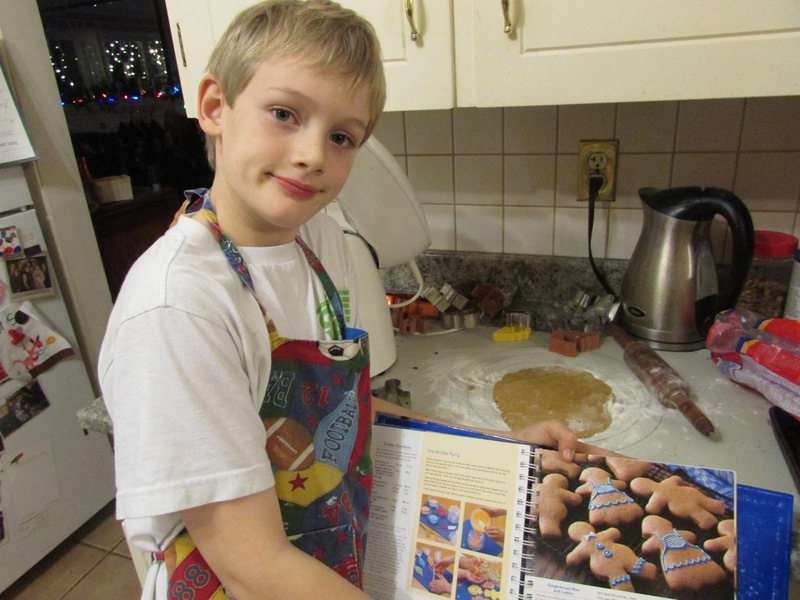 Wyatt Boyd had loads of fun baking Chocolate Reindeer Cookies. 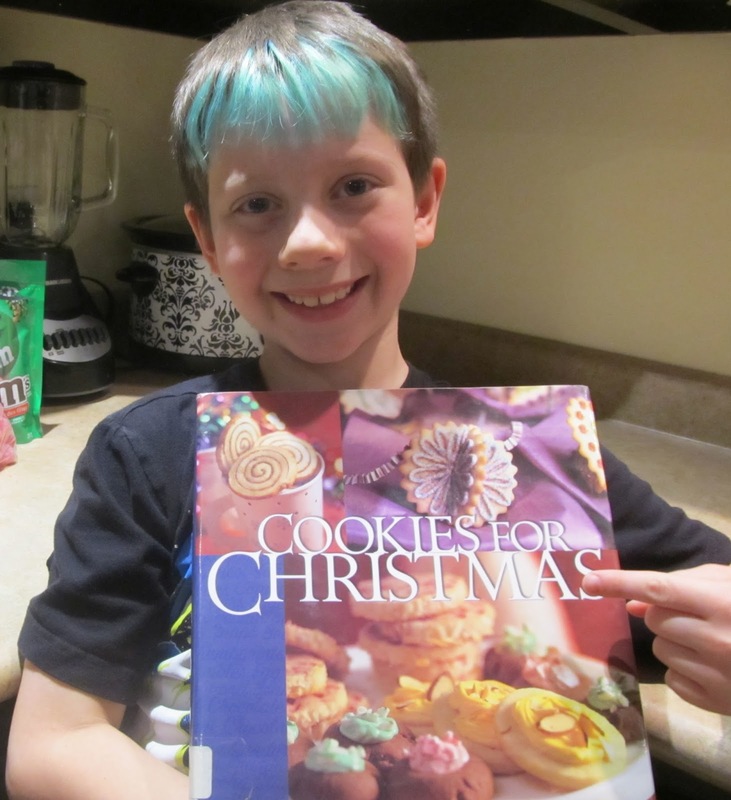 The recipe is from Cookies for Christmas that he borrowed from the Middleton library. The Twelve Days of Cookies is winding down-- the 12th day is Tuesday, December 22. 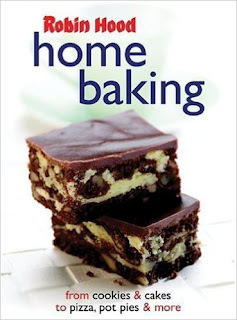 We want to see what you have been baking! If you'd like to win a $35 Gift Card, show us your cookies! Bake cookies from a recipe you found in one of our books, send us a photo, and you could win! All the details are right here, so start baking. Making cookies with your child is fine way to work on math and literacy skills while having a lot of fun. No kids? Cookies make a fine gift for a friend or neighbour. So, what are you waiting for? Show. Us. Your. COOKIES!!! PS! Want to see all the cookie pictures from all the years? Head over to our Facebook page, where we have a photo album of ALL THE COOKIES! 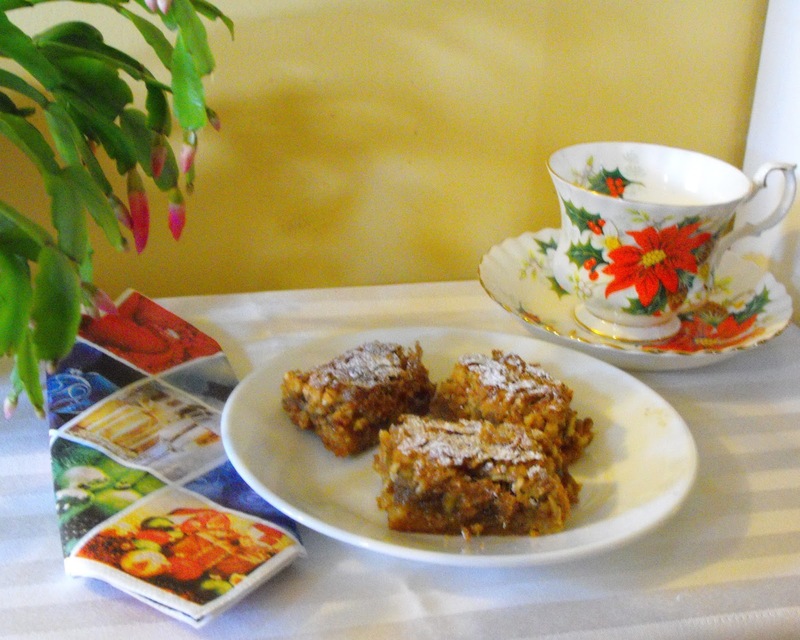 Baked by Barbara of the Berwick Library - The community's living room. Join us for coffee & conversation, music and cookies! Dec 18th, 10 - 12 noon. Everyone is welcome. I chose these cookies because they were simple to make yet had an old world hint to the name and also a hint of the orient. It makes me think of the Silk Road and the three wise men bringing cloves to the Mediterranean. From ChristmasTraditions: Cooking, Crafts, & Gifts. 1. Heat oven to 350 F/180 C. In a large mixing bowl combine butter, sugar, egg, vanilla and brandy extract. Beat at medium speed until light and fluffy. Add flour, baking powder, ground cloves and salt. Beat at low speed until soft dough forms. 2. Shape heaping teaspoon dough into crescent or S shapes. Place shapes 2" (5 cm) apart on ungreased cookie sheets. Press 2 whole cloves until into each shape. 3. Bake for 9 to 11 minutes, or until set. Let cool 1 minute before removing from cookie sheets. Sprinkle cookies with powdered sugar. Cool completely before storing. Remove whole cloves before eating. Tip: flavour of cookies improves after a few days of storage. These shortbread look so good!! Thanks Connie! Pop into the Bridgetown Library today and get one before they are all gone. 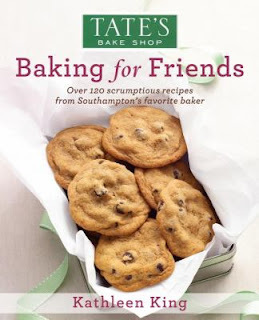 You will find this recipe in Baking for Friends by Kathleen King. 1. 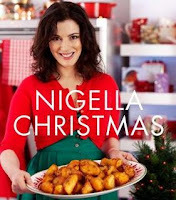 To make the shortbread, in a medium bowl, whisk together the flour, baking powder, and salt. In a large bowl, beat the butter and brown sugar with an electric mixer set on high speed until combined, about 1 minute. Beat in the egg, followed by the orange zest, orange juice and vanilla. With the mixer on low speed, mix in the flour mixture just until combined. 3. Position the oven racks in the top third and centre of the oven and preheat the oven to 325 degrees F. Line 2 baking sheets with parchment paper or silicone baking mats. 4. Working with 1 disk at a time, briefly knead the dough on a lightly floured work surface until smooth. Roll out the dough 1/8 inch thick. Dip a 2 ½-inch round cookie cutter or another shape of a similar size in flour and cut out cookies, cutting them as close together as possible to avoid excess scraps. Arrange the rounds about 1 inch apart on the prepared baking sheets. Gather up the dough scraps and gently knead together, and cut out more cookies. If the dough becomes too soft to roll out, refrigerate until chilled. Refrigerate any remaining dough while you bake the first batch. 5. Bake, rotating the positions of the sheets from top to bottom and front to back halfway through baking, until the cookies are lightly browned on the edges and bottoms, about 20 minutes. The cookie tops will not brown, but do not under bake them, or they lack flavour. Let cool on the baking sheets for 5 minutes. Transfer to wire cooling racks and let cool completely. Repeat with the remaining cough, on cooled baking sheets. 6. To dip the cookies, line baking sheets with parchment paper or baking mats. Put the chocolate in a microwave-safe medium bowl. Heat the chocolate on Medium (50% power), stirring at 30-second intervals, until fully melted. Let stand, stirring occasionally, until the chocolate has cooled to 89 degrees F on an instant-read thermometer. Place the bowl in another bowl of hot tap water to keep it warm enough for dipping, being careful not to splash water into the melted chocolate. 7. One at a time, dip one half of each cookie into the chocolate. Drag the bottom of the cookie across the rim of the bowl to remove excess chocolate, and place the cookie on the baking sheet. If the chocolate cools and thickens, warm in the microwave for 15 seconds at Medium. Let the cookies stand until the chocolate sets and they can be easily lifted from the baking sheet, about 1 hour. 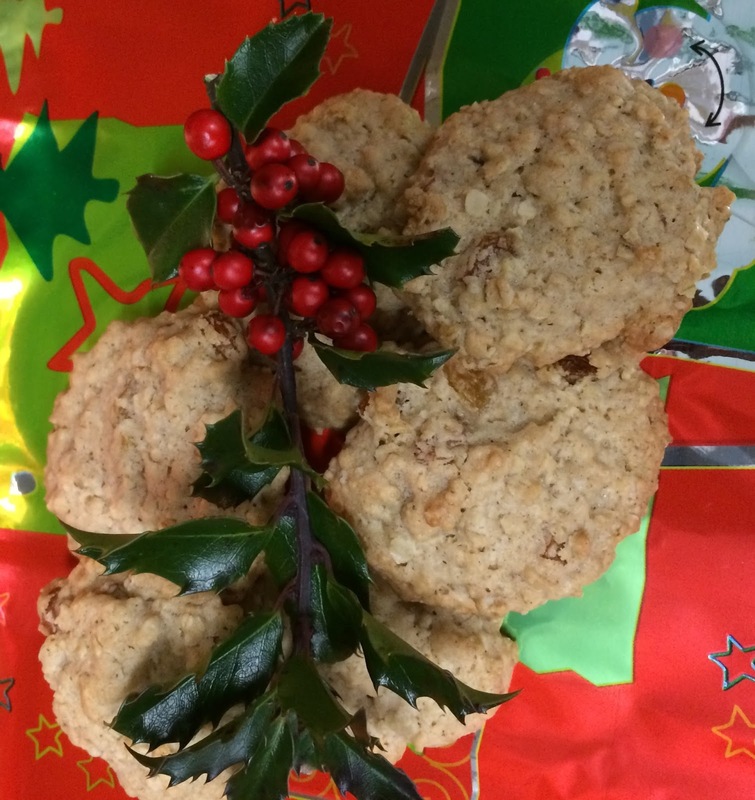 Today’s dunk-a-licious cookies were made by Lisa Rice. Drop into the Wolfville Memorial Library and have a sample. From Taste of Home: Grandma’s Favorites (pg. 197). In a mixing bowl, cream the butter and brown sugar. Add egg and vanilla; beat well. Combine dry ingredients; add to creamed mixture. Stir in nuts if desired. On a lightly floured surface, shape the dough into three 10-in. x 1-in. rolls. Tightly wrap each roll in wax paper. Freeze for at least 12 hours. Cut in to 3/8 in slices and place on greased baking sheets. Bake at 350° for 6-8 minutes. Remove to wire rack to cool. Yield about 7 dozen. Lisa’s note: These can also just be rolled out and cut into shapes without freezing. Perfect with coffee, tea, or hot chocolate. Great for dunking! Jaki made these gems to share today at the Frank Morse Memorial Library in Lawrencetown. She claims they will melt in your mouth. 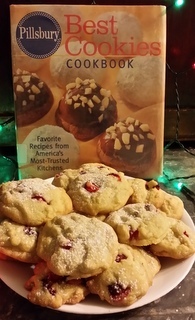 This recipe is from Pillsbury Best Cookies Cookbook: favorite recipes from America's most trusted kitchens. 1. Heat oven to 350 F. In a large bowl, combine sugar, powdered sugar, butter and oil; blend well. Add orange peel, vanilla and egg; blend well. In a separate bowl combine flour, baking soda, cream of tartar and salt; mix well and add to creamed mixture. Mix well. Stir in cranberries. Drop by spoon full 2 inches apart onto ungreased cookie sheets. 2. Bake at 350. F for 10 to 15 minutes or until bottoms are a light golden brown. Cool 1 minute; remove from cookie sheet. Cool completely. Dust lightly with powdered sugar. Easy to make and yummy. I also tried some with dried cranberries and don't recommend that... it is best with fresh/frozen - I added more than the amount in the recipe as I love cranberries. The cheery staff at the Kentville Library will be handing out these "feel good" treats today. They were baked by the always smiling Gail Aldred. 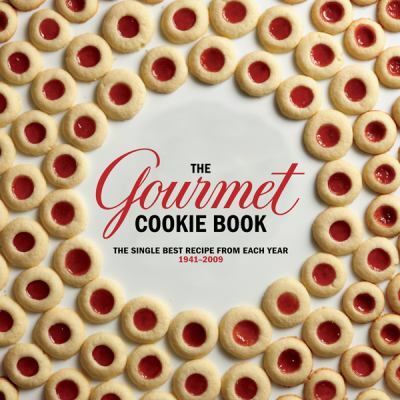 From the book Cookies: 200 Inspirational Cookie Recipes by Susanna Tee. "These frosty faces are sure to put a smile on your face and tickle your taste buds. 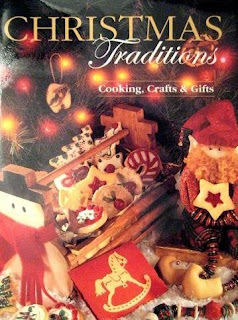 The cook book I selected has a wide variety of recipes to choose so you will never be short of ideas to make something heavenly for friends and family, whatever the occasion. Another good thing is the recipes are easy to follow using mostly cupboard ingredients." Place the butter and sugar in a large bowl and beat together until light and fluffy. Add the egg and honey and stir to combine. Sift in the flour and cinnamon and mix to form a soft dough. Wrap the dough in plastic wrap and chill in the refrigerator for 30 minutes. Preheat the oven to 375 F/190 C. Line a large baking sheet with parchment paper. Cut the dough in half and roll in the remaining flour, then roll out each piece between 2 sheets of plastic wrap. 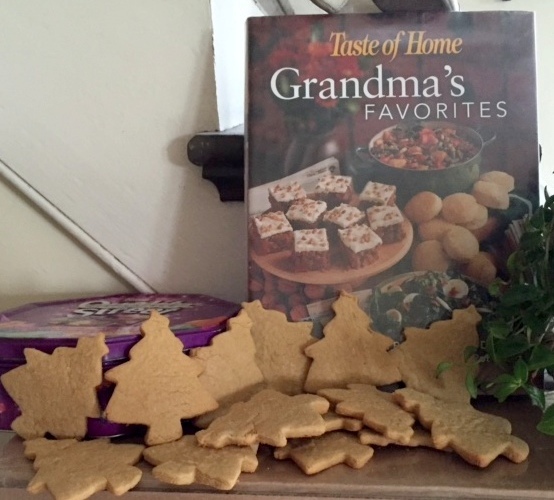 Using a 2 ¾ - inch /7 – cm cookie cutter, cut our 10 disks from each piece and place on the baking sheet. Bake in the preheated oven for 10 – 12 minutes, or until golden brown. Let cool for 5 minutes, then transfer the cookies to a wire rack to cool completely. Sift the confectioner’s sugar into a bowl, add the water, and mix until smooth. Spread the cookies with a thin layer of icing, then use the chocolate sprinkles for hair and a gum drop for the nose. Let set, then draw in the eyes and mouth with the decorating icing. Note: I added 1 TBSP of shortening to the icing and substituted black coloured sugar instead of chocolate sprinkles for the hat. Sue Mullen is sporting a big smile as she gets to show off the refurbished Murdoch C. Smith Memorial Library in Port Williams. To help celebrate she has made these Christmas Rocky Road Bars to share with you. From the book, NIGELLA CHRISTMAS by Nigella Lawson, page 28. 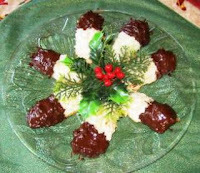 Chop all chocolate into small pieces and put into heavy-based pan to melt with the butter and syrup over a gentle heat. Put biscuits into a freezer bag and bash with a rolling pin to get big and little-sized crumbs. Do the same thing with the Brazil nuts so you get different sized bits. Take the pan off the heat and add the crushed biscuits and nuts, whole glazed cherries and mini-marshmallows. Turn carefully to coat everything with the syrupy chocolate and tip into a foil tray (236mm x 296mm), smoothing the top as best you can – it will look lumpy. Refrigerate until firm (about 1⅟2 – 2 hours). Remove from foil tray. Push icing sugar through a small sieve to dust the top, then, if you like, sprinkle with edible glitter. Make ahead tip: Make and refrigerate to set. Don’t add icing sugar yet but cut into bars and store in an airtight container in a cool place for up to one week. Decorate as above 1-2 hours before serving. Freezing tip: Make the Rocky Road as above and freeze for up to one month. Thaw overnight in a cool place and decorate as above. 1. Combine coconut, sugar and flour in a large bowl. Add egg whites and vanilla. Mix well. Stir in almonds. 2. Shape heaping tablespoons (20ml) of mixture into logs and place on prepared cookie sheet. 3. Bake for 8 to 12 minutes or until golden around edges. Cool cookies completely on sheets, then remove from pan. 4. Dip ends of cookies in melted chocolate. Place on waxed paper. Chill until chocolate is set, about 5 minutes. Omit chocolate or dip one end of each cookie in white chocolate and the other in semi-sweet. I chose this recipe because I love coconut , chocolate, and almonds! They are chewy and quite tasty if I do say so myself! Although the recipe didn’t say, I whipped the egg whites to a frothy mixture before adding to the other ingredients. I think you could toast the coconut beforehand if you wanted more of a crunchy texture. Recipe says these will freeze well if not dipped. 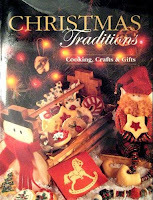 These cookies can be found in Christmas Traditions: Cooking, Crafts & Gifts, page 228, and were made by Cathy Lothian. Drop into the Windsor Library and get a Viennese Kiss. While they last!! Heat oven to 350* / 180*. Grease two 12-cup mini muffin pans, set aside. 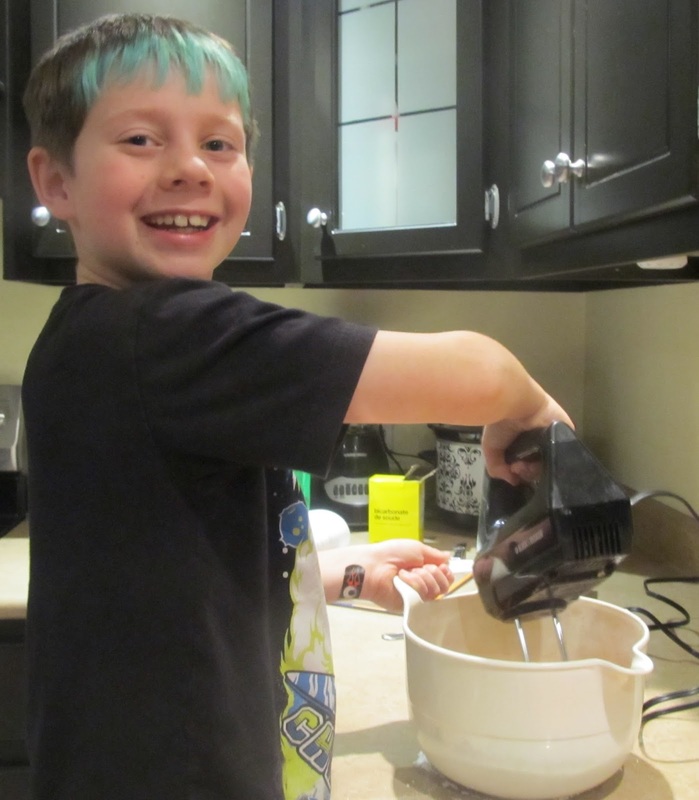 In large mixing bowl, combine flour, butter and sugar. Beat with electric mixer at medium speed until mixture resembles coarse crumbs. Add sour cream and vanilla. Beat at low speed until soft dough forms. Shape dough into 1” (2.5cm) ball. Place 1 ball in each prepared muffin cup. Bake for 20-25 minutes, or until edges are golden brown. Immediately press kiss into center of each cookie. Let cool 1 minute before removing from pans. Cool completely before storing. Note from Cathy: This cookie is very easy to make but be patient. The soft dough will form, it just takes a couple of minutes. Although it calls for mini muffin tins, you could easily use a cookie sheet as the balls do not spread or change shape until you press the kiss into the top. Also, make sure you press the kiss on so it is flat or it will slide off as the bottom melts . 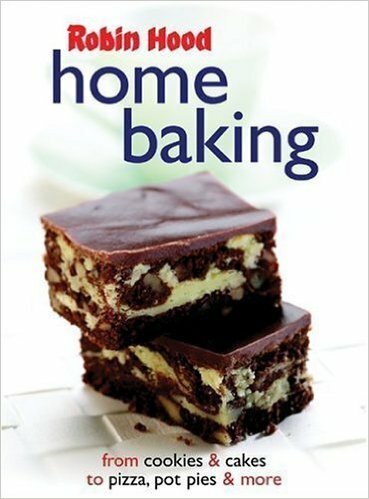 Baked for your tasting pleasure by Sue Aldred. You can sample these chocolate bits of heaven today at the Rosa M. Harvey Middleton and Area Library. Just as good as the store-bought patties, but better because you made them at home! Mix flour and milk in a small saucepan until smooth. Stir constantly on medium heat until boiling and very thick. Remove from heat. Add icing sugar and peppermint flavouring. Mix well. Let stand for five minutes. Turn onto surface dusted with icing sugar. Knead until smooth, adding more icing sugar as necessary, until no longer sticky. Divide into 2 equal portions. Shape each portion into a log, 1 inch in diameter. Cover with plastic wrap. Let stand at room temperature overnight. Cut into ¼ inch slices, re-shaping as necessary. Place on ungreased baking sheets. Let stand, uncovered, for about an hour, turning at halftime, until dry. Heat the chocolate and paraffin wax over simmering water, stirring occasionally, until melted. Dip patties into chocolate (see tip below), allowing excess to drip back into melted chocolate. Place on foil or waxed paper-lined baking sheets. Let stand at room temperature until firm. Makes about 5 dozen mint patties. Enjoy and Happy Holidays! Tip: For best results when dipping candies into chocolate, be sure the candy is room temperature. Place candy on a fork and lower candy into chocolate to cover completely. Lift, allowing excess to drip back into the melted chocolate. 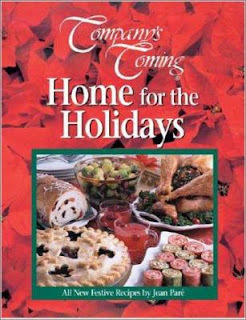 From Company’s Coming: Christmas Gifts from the Kitchen by Jean Paré. Baked by Sue Mosher of our Bookmobile & Off-site services branch. These cookie delights will be on board for you to sample today in East Dalhousie and Springfield. Combine flour and cornstarch in small bowl. Add to butter mixture half at a time, mixing well after each addition, until no dry flour remains. Prepare cookie sheets by greasing them or lining them with parchment paper. Spoon 1/2 of dough into piping bag fitted with medium star tip. Pipe 36 rosettes, 1 1/4 inches in diameter, about 2 inches apart onto prepared cookie sheets. Roll remaining dough into thirty-six 3/4 inch balls. Arrange about 2 inches apart on cookie sheets. Dip flat-bottomed glass into flour or cornstarch. Flatten balls into 1 1/4 inch diameter discs. Bake rosettes and discs in a 350˚F oven for about 10 minutes [check after 5 minutes], until golden. Let stand on cookie sheets 5 minutes before removing to wire racks to cool completely. Beat all 4 ingredients in small bowl, adding more icing sugar or orange juice, if necessary, until spreadable consistency. Makes about 3/4 cup filling. Spread 1 tsp. filling on bottom of each disc. Place rosettes on top of filling. I decided to try making these cookies because they looked so pretty. I made them with lemon instead of orange because I love anything that has lemon and poppy seed. They tasted really good! I found that 10 minutes was way too long for baking time. My cookies were nicely done at 6 minutes, so I would suggest keeping a close eye on them. I made three batches of a dozen each from this recipe, just as was indicated. They weren’t terribly difficult to make but I decided to make the last batch just circles without the rosettes.